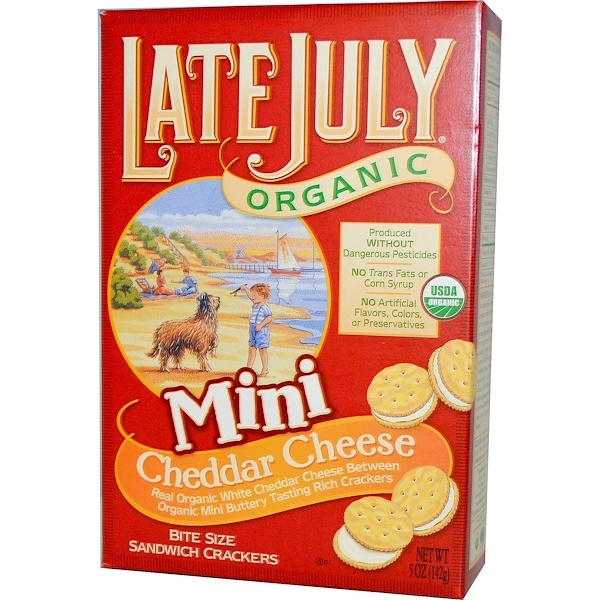 Real organic white cheddar Cheese between organic mini buttery tasting rich crackers. While carefree mid-summer days inspired our name, the love of family inspired our ideals. On any given day you can find three generations at work including my father and cofounder, mother, husband, aunt and three year old son, the boy on the front and the biggest fan of our new organic mini sandwich crackers. As a mother, I'm constantly in the position where I need to give my son a snack on the go, but I'm not willing to sacrifice the quality of the ingredients for convenience. These mini sandwich crackers were developed with him in mind. Our family hopes you enjoy them. Why choose our organic snack? Because while it's popular now to make products with all natural ingredients, in the 25 years our family has been making snack foods, we've always used them and always will. 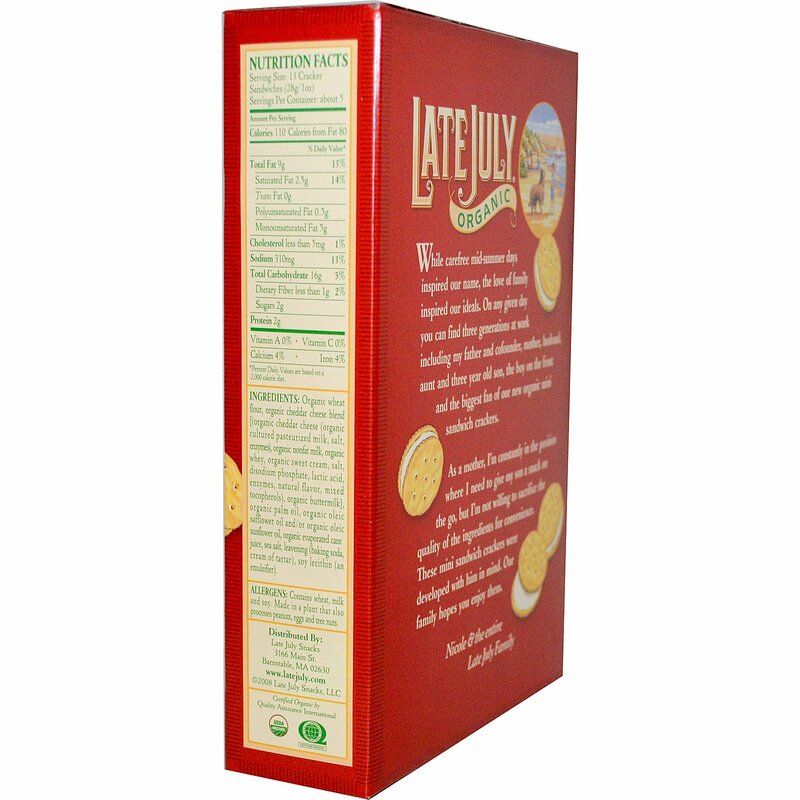 All with our new company, Late July Organic Snacks, we've taken that dedication to a higher level by using organic ingredients. Also, we are family owned and operated and all our products are certified USDA Organic. Organic wheat flour, organic cheddar cheese blend [(organic cheddar cheese (organic cultured pasteurized milk, salt, enzymes), organic nonfat milk, organic whey, organic sweet cream, salt, disodium phosphate, lactic acid, enzymes, natural flavor, mixed tocopherols), organic buttermilk], organic palm oil, organic oleic safflower oil and/or organic oleic sunflower oil, organic evaporated cane juice, sea salt, leavening (baking soda, cream of tartar), soy lecithin (an emulsifier). The Organic Ingredients in our new Mini Cheddar Cheese Sandwich Crackers are produced without dangerous pesticides, chemical fertilizers, genetic engineering, antibiotics or added growth hormones. They also contain real organic cheddar cheese, no trans fats, no hydrogenated oils, no corn syrup, no artificial flavors, no artificial colors, no preservatives, and are U-D and lacto (dairy) vegetarian.